Guides for church family or church webmasters. 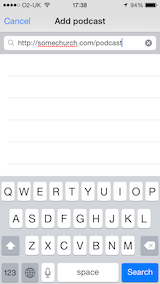 1) The first page you see is the Talks tab. 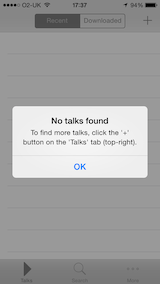 The first time you use the app, no talks will be listed because no sermon podcast feed has been subscribed to yet. 2) Click the "+" sign at the top-right hand corner and either subscribe to one of the suggested podcast feeds or search for one by keyword or by its podcast URL if you already know it. 3) If you choose the latter option, just enter the URL of your church sermon podcast feed and select it when the app has found it. 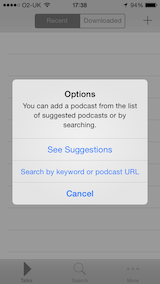 5) The More tab allows you to edit your podcast subscriptions, browse podcast suggestions amongst other options. 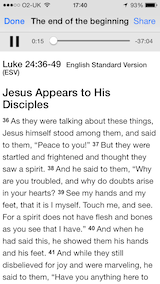 6) When you download and play a sermon which also has a Bible reference, the passage will show along with the audio. To start using CrossPreach to store your talks and obtain a data feed for them, first sign up with the name of your church and the details of a primary contact. (Additional users can be added subsequently so they can have access to the sermon upload feature and other admin tasks.) Once logged in, go to your profile page by clicking on your email address in the top-right corner of the page. Your profile page shows a user menu on the left. 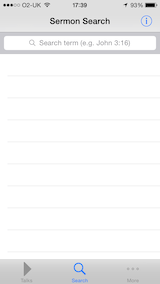 If you have the .mp3 audio file of a talk and the relevant details then select "Upload sermon". You can select which sermon series it belongs to and which speaker gave the talk. (You can add these options if they do not yet exist.) After providing additional information such as the date, time and Bible passage of the talk, browse to the corresponding .mp3 file and click "Upload". Depending on the size of the file and your internet connect speed, uploading could take a few minutes. Please wait for the process to complete. Once it has completed, a message will be shown that the file is queued for processing - this should take around 5 minutes. You can check the status by clicking on "List sermons". A link to an RSS feed is also available on this page. Use the URL of this RSS feed (of the format https://www.crosspreach.com/sermons/listall/[churchid].rss) in the mobile app to display sermons or simply search by your church name. 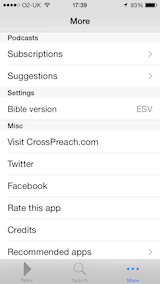 There are two ways to display the latest sermons that have been uploaded to CrossPreach on your website so that others can download and listen to them. Both methods require you to know your churchid, which is the integer value that is at the end of the "Church" link on the user menu of your profile page. (substituting [churchid] with the relevant integer) and processing it to display the sermon information. It is recommended to add a style parameter inside the iframe tag to set its height, width and hide the border.